Still no confirmation from Apple on what they will be announcing on March 7. But on March 7 there will be something – invites were sent out last week. Invitations to the announcement included the statement “We have something you really have to see. And touch.” A photo on the invite looks like the bottom of an iPad (see below). 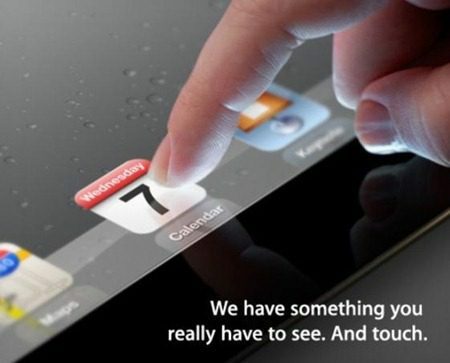 So let’s run with the iPad 3 speculation. If that is what Apple launches this week, what will it be like? Most of the speculation leans toward a machine the same size as the current 9.7 inch iPad 2. There have been some indications that Apple may be working on a 7 inch tablet as well… but that’s not expected to be ready to hit the market yet, if they actually make one. The iPad 3’s screen resolution is expected to be fantastic. 2048 x 1536, as compared to the current iPad 2’s resolution of 1024 x 768. Documents reported leaked from Apple suppliers refer to the display as a ‘retina display’ due to its high-def resolution. Processing wise, it’s expected that a new iPad 3 would include a quad-core processor. There have been some reports that there will be a model with 128 GB of storage. There may be a 4G LTE version of the iPad 3 when launched. Looks wise, it may appear very similar to the iPad 3. Perhaps slightly thicker to deal with the high-def screen and an increased battery size. The new tablet is also expected to run on Apple’s new iOS 5.1. Pricing? Hard to say. Tablets, or at least Android based tablets, have been undergoing some intense downward pricing pressure. So far, Apple seems pretty immune to that – but eventually one would expect the lowering price of tablets to effect Apple. But it might not yet. Its expected that the price of the remaining iPad 2s in stock, some are saying quite a bit, until the remaining inventory is sold off.